Preparation time: 5 minutes. Cooking time: 7–9 minutes. Coat a nonstick skillet with cooking spray and warm over medium heat. 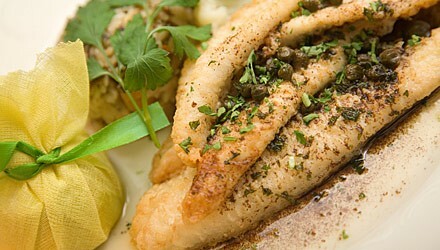 Melt margarine in the skillet, then add tilapia fillets. Cook fish 2–3 minutes on each side, or until it flakes easily when pierced with a fork. Transfer fish to a serving dish and cover to keep warm. To skillet, add lemon juice, lemon zest, wine, and capers; stir to combine. Cook 1 minute then pour over fish.